Limited downcounty development opportunities and the high demand for housing locations near public transit and amenities has resulted in significant teardown of existing single-family home activity. The teardowns are a one to one-unit replacement, so while there is no overall loss of housing units, the new units tend be larger and more expensive than the older units, often replacing more affordable housing starter homes. An analysis of demolition permits from the Montgomery County Department of Permitting Services shows that since 1990, there have been nearly 4,400 demolition permits issued for single-family detached homes. Since 2000, the county has averaged over 150 teardowns of single-family detached units a year, peaking in 2006 at 276 permits. Since 2013, the county has averaged over 230 a year. As shown in the map, this pattern is largely concentrated in downcounty, as more than half of the demolition permits (51 percent) were issued in Bethesda, followed by Silver Spring (8 percent), Chevy Chase (8 percent), Potomac (6 percent) and Rockville (6 percent). Comparatively, redevelopment of multi-family facilities in Montgomery County has been much more limited. Demolition permits show that since 1990 there have been only been six instances of demolition and redevelopment of existing multi-family facilities. 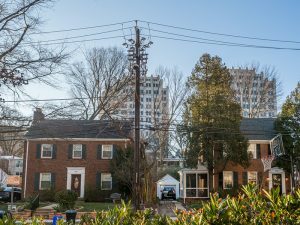 Two of the redevelopment projects (The Bonifant and Chevy Chase Lake) were public-private partnerships with the county that significantly increased total unit and affordable housing unit counts. Chevy Chase Lake previously had 62 units and was redeveloped to have 262 units, including 90 affordable units. The Bonifant had 31 units and was redeveloped to include 149 total units, of which 139 are affordable. The other three projects include The Blairs, which increased its unit count from 266 to 507 and provided 80 percent of its required MPDUs in an existing building that provided more family-sized bedroom units than would otherwise be required. 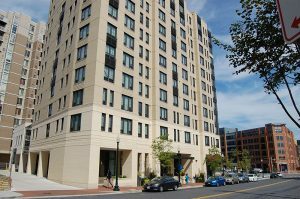 The other three projects were Glenmont Metro Centre (increased unit count from 306 to 477), The Lauren in Bethesda (increased unit count from 12 to 64) and the Cameron in downtown Silver Spring, which increased the unit count from 79 to 325 units. These three projects created over 100 income-restricted units within the MPDU program. Based on this data, we see that the pressures of redevelopment for the single-family and multi-family markets are different. The single-family market has responded to the lack of land for new development by tearing down existing single-family homes to create larger, more expensive homes. The multi-family market has responded by redeveloping smaller, underutilized parcels (think parking lots) instead of redeveloping existing multi-family structures. This information will help inform our work on the General Plan, as the county moves from greenfield development to infill and as we work to create a sustainable General Plan with flexible housing options for all.